This beginner crochet bag is the perfect project for beginners to gain more confidence in their crochet skills. It’s a mindless pattern once you get going on it, which is another bonus for beginners as they finally get to relax a bit. With that said, the beautiful texture created by the moss stitch is sure to please crocheters of all skill levels. This bag is crocheted in one piece from the bottom up. After the bottom is completed, the bag is turned after each round in order to keep the seam straight. Turning also helped to create a bit of a different texture. And texture is always good. 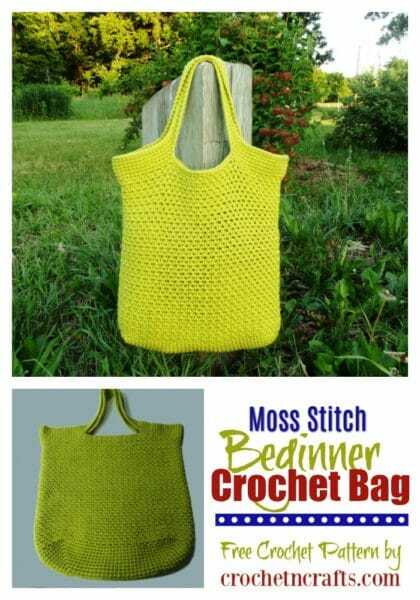 For the more experienced crocheters, here is a crochet bag pattern that you might enjoy. Although the same style as this, it’s a great texture that you’ll enjoy showing off. This small crochet bag is also suitable for a beginner. Or check out the entire collection of crochet bags. So without further ado, here is the pattern. Let me know if you have any questions or if you need help. Gauge: 2″ over 7 sc sts. Finished Size: When laying flat it measures 13.5″ across and 14″ from top to bottom. Depth measures 5″. Rnd 11: Ch 1, (sc, ch 1) in same st as join, *sk next st, (sc, ch 1) in next st; rep from * around; sk last st; join with sl st in first sc. TURN. Rnd 12: Ch 1, (sc, ch 1) in first ch-1 sp and into each ch-1 sp around; join with sl st in first sc. TURN. Rnd 13-54: Rep rnd 12. Rnd 55(RS): Ch 1, sc into each st and ch-1 sp around; join with sl st in first sc. (112 sts) Do Not Turn at this round or hereafter. Rnds 58-60: Ch 1, sc in same st as join and into each st around; join with sl st in first sc. FO at last rnd. Rnd 57-60: Same as rnds 57-60 above. FO at last rnd. 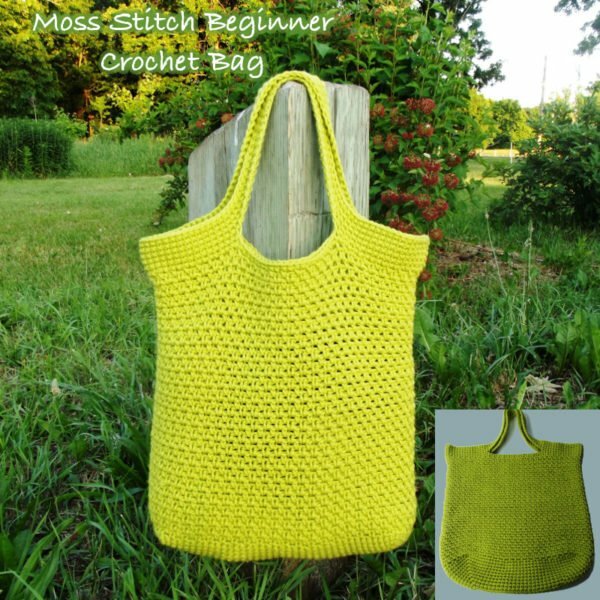 If you enjoyed this simple crochet bag pattern you might also enjoy a browse through more bag patterns here on CNC. This is a lovely bag :) thank you for linking up at last week’s party! Thank you. Sometimes I have time to link up and sometimes I don’t, but I really appreciate the opportunity. For this bag, do the slip stitch joins count as a stitch? I can’t get the stitches to work out right no matter what I do. Is it really necessary to ch 1 every time before making the first sc for the next round? The slip stitch joins do not count as a stitch. However, up to round 11 you work your first into the same stitch as where you made the join. After that you turn and then crochet into the first space. As for the chain 1, I don’t think you can go without it if you’re crocheting into the same stitch as where you made the join. 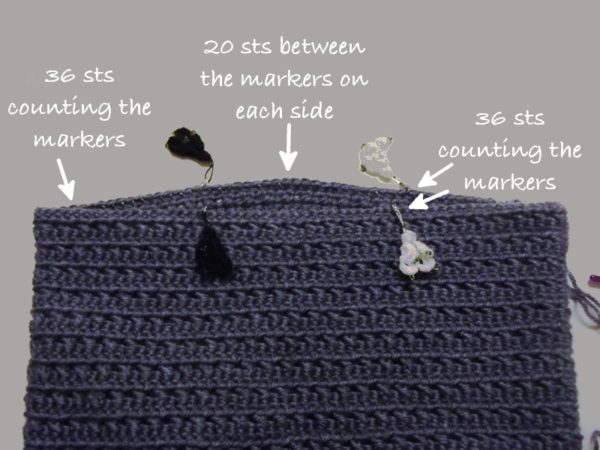 when working the first stitch into the next space you might be able to eliminate it. Another option is to use your chain-1 as your first st in the round. Let me know if any of the above are helpful, or what rounds in particular you are struggling with. Lovely bag…can I use a cotton yarn for this bag? Ive never made a bag and this will be my first attempt :) We will see how it goes, I’ve gotten into the habit of watching videos instead of reading a pattern so I hope I can do this!! What would I need to do so that the bag is larger than the one in the pattern? 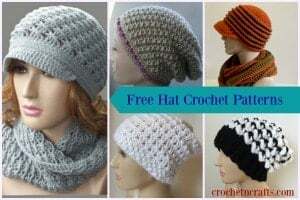 You would need to continue to crochet the bottom part until you have reached a desired size. Then you’ll need to make adjustments on the handle when you get to it. Such a good opportunity ti learn the cute bag makeing. I do 1st time to make it. Thank you. I hope my one is also be good. Hi how to do round 11 and 12? Is it sc+ch into every space.? Yes, starting in Rnd 12 you work one sc and ch-1 into each space. Hi there, I’m new to crochet :) have you used American or U.K terms? Thanks!